1. How are our competitors going to react to these strategies? 2. What are we doing about retaining certain customer segments at risk because we know they’re considering the competition? 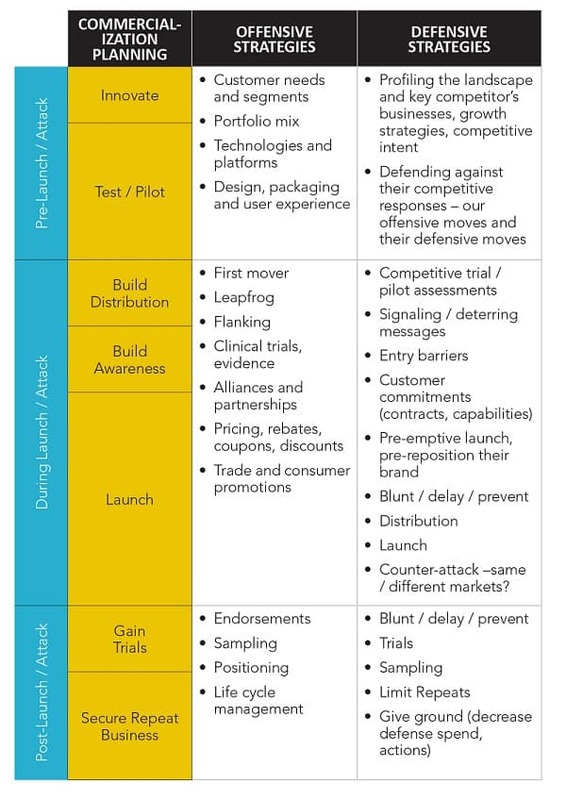 If your commercialization plans don’t carefully consider competitive threats, counter moves to your planned offense (promotions, product launches, etc.) and other threats or risks – by existing and potential competitors – your plans are unnecessarily exposed to failure. Despite widely publicized topics like disruption and convergence, the impact of new technologies and the actions of existing and new competitors and business continue to be an afterthought for a number of business and commercial leaders. Proactive Worldwide’s rigorous and practical approach to commercialization strategy includes a balanced consideration of offensive and defensive strategies; even though offense typically gets the majority of funding. Our methodology considers an initial universe of potential strategies by commercialization phase (Exhibit 1) and flexibly drives-out the requirements and strategies – through meetings, interviews, workshops, war games and/or scenario planning. Throughout 2015 the majority of our client’s strategic plans and scenarios experienced across-the-board increases in the number of threats from new technologies and small, upstart firms with potentially disruptive business models and technologies in the initial landscape scanning phase. That fact highlighted the need for robust defensive strategies and mitigation plans – even if they were initially limited to outline – and resulted in much higher quality, holistic and complete strategies. Are your key customers considering new, disruptive product, service or technology solutions that could significantly displace your existing business? Worse yet, is your market facing new entrants from non-traditional competitors that have value propositions which are making your customers think about switching? How do you know? Proactive Worldwide, Inc. has been providing some of the world’s most admired companies with actionable market and competitive insights to enable commercial and investment decisions which advance their competitive position since 1995. Our primary research, analysis and consulting services deliver clear and concise intelligence that empowers our clients to confidently act on their key opportunities and mitigate key risks.